Sergio de Camargo received his initial training at the Academia Altamira (Buenos Aires, 1946-1948). He then studied philosophy at the Sorbonne (Paris, 1948-1953) while also attending the Académie de la Grande Chaumière (Paris). He returned to Brazil in 1953, at which time he produced a figurative sculpture in bronze and sandstone that showed his great interest in volumes and their position in space. He participated in Brazilian group art exhibitions and presented his first solo show at the Galería Gea (Rio de Janeiro) in 1958. Though becoming acquainted with the artists who, in 1959, signed the Manifiesto Neoconcreto, he did not adhere to this movement or to any other group. He returned to Paris in 1961, where he attended the École Pratique des Hautes Études. During this time he abandoned figurative art and experimented with diverse materials in the field of abstraction. 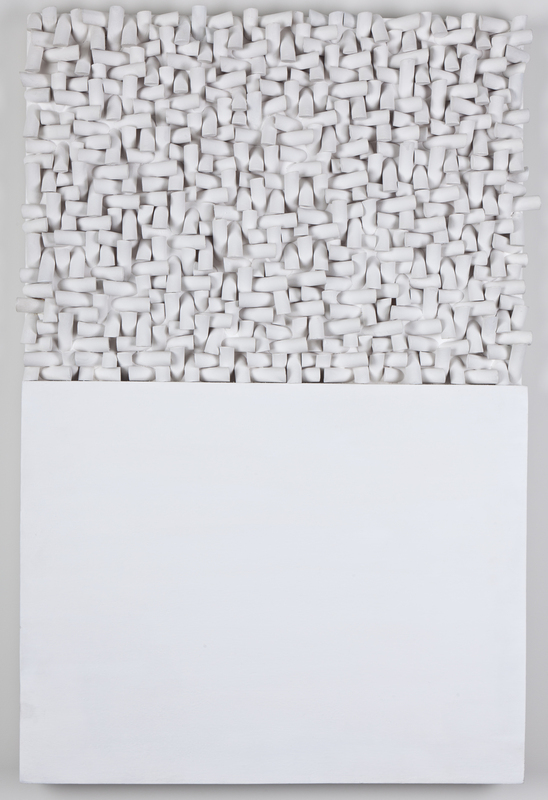 In 1963, de Camargo began the series Relief, comprised of cylindrical wooden modules painted in white and cut and placed on a white wood ground. The different variations in size, number of cylinders, angle of the cuts, and the order they were applied to background planes allowed him to study the relationship between volume and flat surface and light and shade. In 1964, he had a solo exhibition at Signals, in London. He received the International Sculpture Prize at the 3rd Paris Biennial de Paris (1963) as well as the prize for the Best National Sculptor at the 8th São Paulo Biennial (1965). In the mid sixties, de Camargo began to produce sculptures in Carrara marble. One of his first marbles, Homenagem a Brancusi, was presented at the 33rd Venice Biennial (1966). From then on he made important sculptures for public spaces, including El muro estrutural for the Palacio Itamaraty (Brasilia, Brazil, 1967), Torre monumental for the Collège d’Enseignement Technique (Equeurdreville-Hainneville, France, 1973), and an enlarged version of Homenagem a Brancusi for the Faculty of Medicine (Bordeaux, France, 1973), among others. In the 1970s, marble became dominant in his work, and cylinders and rhomboids became dominant in his sculpture in the round. Returning to Brazil in 1974, de Camargo settled in Rio de Janeiro. The next year, he exhibited a set of pieces from his last Parisian period at the city’s Museu de Arte Moderna. In 1981, he was given a retrospective exhibition at the Museu de Arte Moderna. Two characteristics permeated his artistic production in the 1980s: the frequent use of black-Belgian stone, and cuts in very acute angles. His last series, Ovos (1990), consisted of ovoid forms made out of marble or black Belgian stone, on which he practiced subtle incisions and perforations.